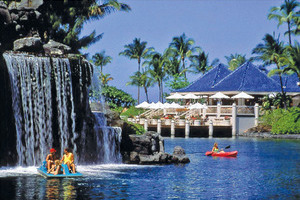 The Hilton Waikoloa is a complete destination in its own right; an extraordinary resort set amidst tropical gardens, waterfalls and lagoons, and linked by a system of trams and gondolas that ferry guests around. 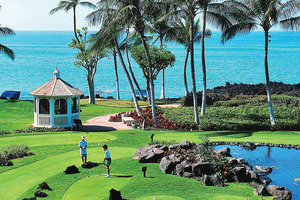 You'll never tire of something to do here; the Hilton boasts eight tennis courts, two excellent golf courses, a protected lagoon and beach, full-service health spa plus entertainment that includes nightly live music, Hawaiian classes and lu'aus. The hotel's most unique feature though is probably its interactive dolphin programme giving guests an opportunity for some reef snorkeling followed by a swim with the dolphins. The Resort View Room offers guests a comfortable accommodation furnished with contemporary elements to suit any and all travellers. The room features a private balcony that grants golf course, garden or mountain views. 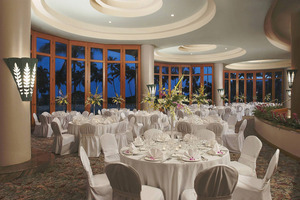 This room is located in the Ocean Tower or Palace Tower. The Partial Ocean View Room offers guests a welcoming accommodation decorated in soothing tones that compliment the surroundings. The room features a private balcony that grants partial ocean views. The Deluxe Ocean View Room offers guests a spacious accommodation filled with style and comfort in the form of plush furnishings and modern amenities. The room features a private balcony that grants superior ocean views. This room is located in the Ocean Tower. The Ocean Front View Room offers guests a magnificent accommodation beautifully fitted with modern amenities that come complimented by island-style decor and natural light. The room features a private balcony that overlooks the Pacific Ocean. The Makai Oceanside King Room offers guests a stylish accommodation lavishly designed with fresh, modern Oceanside concepts that come with a personalised service and exclusive amenities. The room features a private balcony that showcases views of the ocean, dolphins or lagoon. This room is located in the Lagoon Tower. The Makai Oceanside Double Queen Room offers guests a stylish accommodation lavishly designed with fresh, modern Oceanside concepts that come with a personalised service and exclusive amenities. 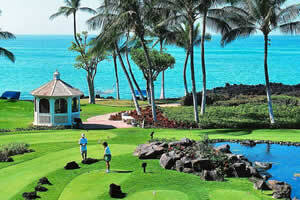 The room features a private balcony that showcases views of the ocean, dolphins or lagoon. The Makai Mountainside King Room offers guests a stylish accommodation lavishly designed with fresh, modern Oceanside concepts that come with a personalised service and exclusive amenities. The room features a private balcony that showcases views of the Island Mountains. The Makai Mountainside Double Queen Room offers guests a stylish accommodation lavishly designed with fresh, modern Oceanside concepts that come with a personalised service and exclusive amenities. The room features a private balcony that showcases views of the Island Mountains. The Makai One Bedroom Suite offers guests a lavishly furnished accommodation filled out with plush comforts and modern amenities all throughout. The suite features a spacious living area and a private balcony that boasts of panoramic views looking towards the dolphin lagoon. This suite is located in the Lagoon Tower. The One Bedroom Suite offers guests a generously spacious accommodation decked out with plenty of modern amenities and further enhanced by plush furnishings all throughout. The suite features an additional living area and two private balconies that boast garden, golf, mountain or ocean Views. This suite is located in the Ocean Tower or Palace Tower. The Royal Suite offers guests an opulent accommodation pleasantly designed with style and sophistication along with a horde of comforts. The suite features an additional living area and two private balconies that boast garden or ocean Views. This suite is located in the Palace Tower. The Presidential Suite offers guests a palatial accommodation intricately designed to ensure a fantastic and memorable time for all with its plush comforts, elegant designs and contemporary amenities. The suite features an additional living area, a kitchenette and two private balconies that boast spectacular ocean Views. This suite is located in the Ocean Tower, Palace Tower or Lagoon Tower. The Makai Ocean View One Bedroom Suite offers guests a magnificent accommodation styled with the utmost care and consideration to ensure an unforgettable stay in a setting filled out with comfort and quality. The suite features an additional living area and two private balconies that boast panoramic ocean Views. The Makai Nai’a Suite offers guests a luxurious accommodation filled to the brim with style, space and comfort like no other spread out over two storeys and housing some additional self-contained perks. The suite features an additional living area, a kitchenette and a private balcony that overlooks the dolphin lagoon. The Makai Naupaka Suite offers guests a luxurious accommodation filled to the brim with style, space and comfort like no other spread out over two storeys and housing some additional self-contained perks. The suite features an additional living area, a kitchenette and a private balcony that overlooks the dolphin lagoon. The Resort View Accessible Room with Tub offers guests a conveniently designed accommodation that not only offers plush comforts and quality furnishings but easily accessible amenities. The room features an accessible tub and a balcony that showcases partial views of the golf, garden or mountain. The Resort View Accessible Room with Roll-In Shower offers guests a conveniently designed accommodation that not only offers plush comforts and quality furnishings but easily accessible amenities. The room features an accessible shower and a balcony that showcases partial views of the golf, garden or mountain. The Ocean View Accessible Room with Tub offers guests a conveniently designed accommodation that not only offers plush comforts and quality furnishings but easily accessible amenities. The room features an accessible tub and a balcony that showcases partial views of the ocean and resort. The Ocean View Accessible Room with Roll-In Shower offers guests a conveniently designed accommodation that not only offers plush comforts and quality furnishings but easily accessible amenities. The room features an accessible shower and a balcony that showcases partial views of the ocean and resort. KPC –Enjoy stunning oceanfront views while enjoying refreshing cocktails and locally sourced island cuisine ranging from seafood specialities to succulent steaks. Imari – Choose from three distinctive styles of Japanese dishes at this elegant eatery that brings fresh sushi, tasty teppanyaki and a la carte dishes to life. Big Island Breakfast – Start your day the right way with a bountiful buffet or a la carte breakfast whilst gazing out at the lagoon. Waikoloa Coffee Co. – Sample some of Hawaii’s unique Kona coffee, fruit smoothies, pastries and quiches at this casual venue. Shaka Cones – Treat yourself and your sweet tooth to a variety of flavourful ice creams, shakes and sundaes for the perfect cool down. 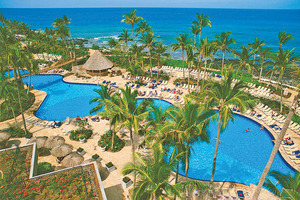 Kona Pool Bar – Select from a menu filled with light bites, snacks and drinks while relaxing near the largest of the resort’s pools. Kohala Pool Bar – Ease back, bask beneath the golden sun and sip on some of the best mai tai’s the island has to offer at this glorious pool bar. Orchid Marketplace – A great location for a quick bite; this charming family-friendly locale is set alongside the Kona Pool. Lagoon Grill – Take a time out to enjoy the sights of the dolphin lagoon while grabbing a tasty grill bite to eat. Boat Landing Cantina – Arrive at this charming restaurant on a canal boat and sup on the delicious Mexican dishes infused with island flare. Dona & Toni’s Pizza – Order your favourite pizza creations at this Italian-style diner to take out or eat in. Kirin – Prepare the palate for a sumptuous dining experience where the full flavours of exotic Chinese cuisine are perfectly crafted. Malolo Lounge – Relax and take a seat at this relaxing lounge where Old Hawaii lives on in the form of inspired appetisers and light fare.